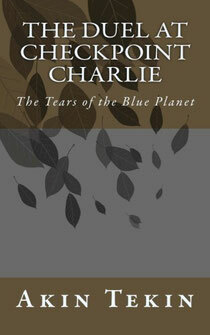 The greatest environmental novel of all time - akintekins Webseite! By writing down my sorrows in this damned cold cell, I relived my childhood once again. As I warmed my child-hands on the breast of my mother, the lock of the iron door turned. A significant number of policemen stepped inside. My cold room became significantly colder. My soul suffered additional pain! I was put in handcuffs. The corridors of the prison were filled with noise. Reams of paper were inserted into the machines. Questions were posed; statements were recorded. “They were shooting at me from every watchtower; in self-defense and to intimidate them, I shot back,” was my answer. I was locked up in my cold cell once again. One day the iron door was opened again and armed soldiers brought me to the first row of seats in a courtroom. The courtroom filled up, the judges in their robes stood before me, my personal information was stated and I was bombarded with questions. The states attorney read the indictment aloud; in his view, I was a terrible criminal. My neck was growing stiff from looking up at the judges. I want to repeat simply and concisely the accusations that were being levied against me in exaggerated pronouncements and jargon. The chief justice was visibly relieved; she probably thought I would address her as “Ursula.” The accusations were repeated in detail. The typewriters clattered. Statements were recorded.